Without the battery, the van won’t have light, heat, cooking facilities, a water pump, or any of the other things that turn it into a useful place to hang out. We chose to use a Lithium Ferric Phosphate (LiFePO4) battery. Lithium batteries can take a charge much faster than lead-acid batteries. They also don’t mind being left in a state of partial discharge, and they can be discharged to around 20% capacity without impacting their service life. Our system came from Balqon in California. It also incorporates a pretty basic battery management system to prevent it from being overcharged or drained too much. Unfortunately, although Balqon’s prices are good, I can’t recommend using them. They are used to dealing with commercial customers. They do not answer the phone or respond to email. Their customer service is non-existent. I wrote more about my experiences on the Sprinter forum. Update: Looks like Balqon is out of business now. Not really surprising. I’d be tempted to look at cells from a manufacturer like CALB. Remember – each cell is only 3.2 volts, so you need four in series for a 12v system. Four of the ones I linked to will provide 180 amp hours. Buying eight will give you 360 amp hours, which is probably a good starting point for most people. Lead-acid batteries don’t like being discharged beyond 50% of their capacity. They also get upset if they are left at less than 100% charge for more than a day. They weigh a lot more than lithium batteries too. When you take into account the added usable capacity of a lithium battery, a lithium solution will weigh about one quarter as much as an equivalent capacity lead-acid battery bank. My neighbor Ken helped me place our battery into the box he designed and built. It was easy enough for two people to carry. Each one of the four equivalent lead acid batteries would have been too heavy to easily pick up. That’s a massive space and weight saving for use in a vehicle. So what are the downsides to lithium? One concern is that they tend to blow up. Boeing had problems with the batteries on their Dreamliner planes. Radio Control plane enthusiasts store their batteries in ammo cans and charge them very, very carefully to prevent them from getting too hot and going into “thermal overrun” (also known as “bursting into flames”). Luckily, LiFePO4 uses a different chemistry to those volatile batteries. It is thermally stable to over 500 degrees Fahrenheit, which is plenty for us. Lithium batteries also don’t like being charged up in sub-zero temperatures. For us that means keeping the battery inside the living area of the van, and making sure that there’s warmth in the van even if we aren’t using it. Luckily, because the battery only takes up ¼ the size of a lead-acid equivalent, we’re not losing much space inside. Another big downside is cost. The up-front cost of lithium is about 2x to 4x the equivalent cost of a lead-acid system of the same usable capacity. However, the service life of lithium battery packs is at least 10 years if they are well treated, compared to 3-5 years for lead-acid. So, if you are prepared to start with a relatively bare-bones lithium system as opposed to one of the overpriced drop-in lead-acid replacement systems, and if you have the extra money to invest in the system up-front, then lithium at least breaks even with and may even cost less per usable amp-hour than lead-acid in the long run. Update: We wrote some guides for choosing battery types and sizing your battery. 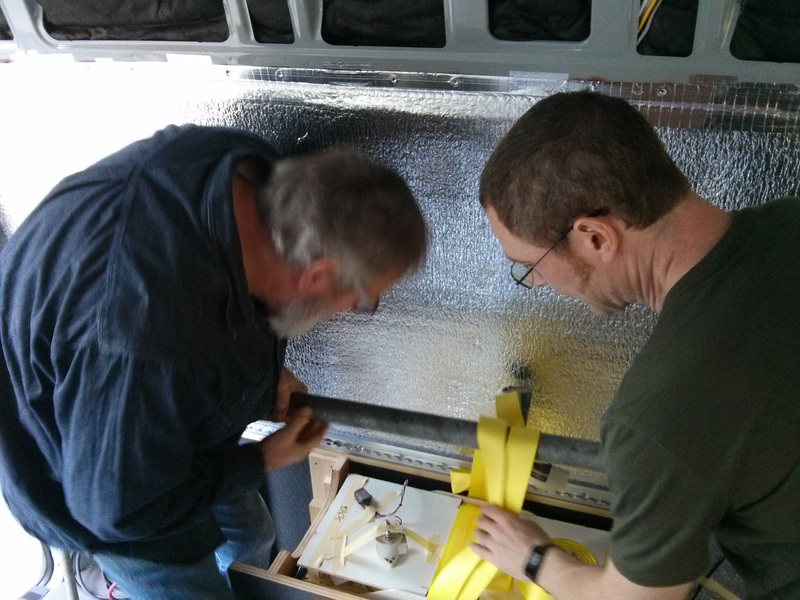 how do you make sure there’s warmth in the van when you’re not using it? seems like a difficult requirement to meet. The Airtronic D2 diesel heater I installed can be set to maintain a certain temperature. Most of the time though, that’s not an issue. The van heats up really quickly when you run the heater. In the Pacific North West we don’t have too many sub-zero days either. I am loving your site! In the midst of my own Sprinter conversion in Seattle and stumbled upon you using many of the components I was leaning towards for Solar/Electric- good to see them functioning in a system. You did link to a CALB CA180FI 180Ah LiFePo4 Cell, which, with 8, would result in a ~380Ah 12v storage unit for ~$2k? What was the cost of the battery system unit you from Balqon? The Balqon system was ~ $4500 for 700Ah. You can find it on their web site. However, like I mentioned in the post, I wouldn’t buy from Balqon. They just aren’t set up for consumer purchases and their customer service is non-existent. I would really recommend working with a company who know their products and can explain them to you. Having someone you can turn to for advice and assistance with your setup is important. I totally agree!!! Still in the dreaming stage myself, but this site distills a LOT of information that would otherwise take many hours trolling the forums. Thanks Joel. I’m glad you like the site. The forums are great but like you say it takes time to find the right information. When you put in the battery box, you cut a hole in the floor so that the batteries rested on the metal floor of the van. (I think that’s what you did; you mention cutting the hole in the wood floor where the battery box will sit.) Why not put the batteries on the finished floor? Thanks for doing this website. We wanted to be able to remove the floor without moving the battery box. Turns out, that wasn’t such a big issue. If I was doing this again I’d put the battery box on top of the floor. This website is amazing! Thank you for documenting all this…I wanted to get the same battery as yours, can you tell me what kind and where you bought it? Hey Lyle, like it says in this post, the battery is from Balqon. We would not buy from them again because their customer service is terrible. It’s also possible that they’ve subsequently gone out of business. The battery cells are made by Winston. You may be able to find a different U.S. supplier. I suggest you check out our post on lithium versus lead acid batteries because it contains a list of people who sell lithium systems. There are lots of options out there. Hey Dieselfumes, I really admire your battery setup and wish I had the money to build something like that. 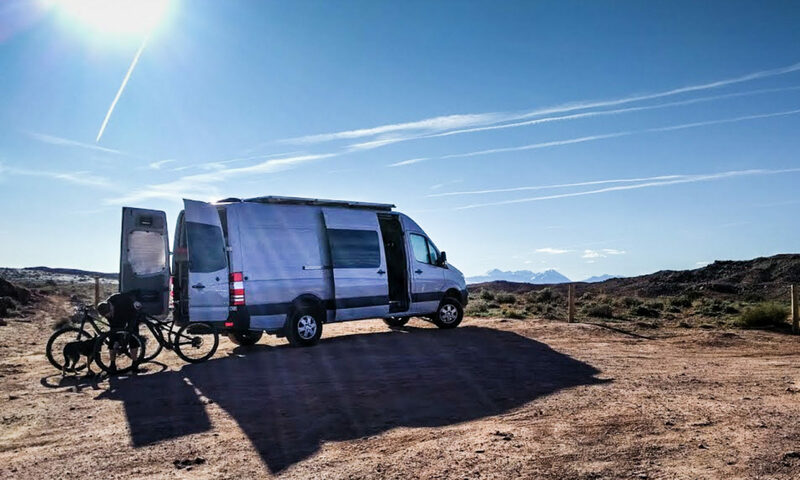 I have personally been on the road for 3 years on motorcycle and only now converting to Sprinter. I want to run the bells and whistles (induction hob, fridge, fan, D2/D4 heater, laptop etc), but just don’t have the money to put into Lithium batteries right now. My budget for batteries is maximum $1000 and inverter to power induction cooktop maybe $500 tops. Wanting to run 690AH of 12v xplorer 230ah AGM batteries, a generic inverter, a Blue Sea ACR, and 6x 100w flexible solar panels up top (low-profile but mounted on ribs up top with airflow underneath). Any advice on doing it the cheap way? I know you’re really not a fan of doing it like this, and if I have to replace the batteries in 3-5 years it is okay, but just right now I am not in a position to spend up large on the lithium. Can this setup keep up with my requirements? Reuben, if you’re coming from 3 years of living out of motorcycle panniers, *any* battery power is an improvement! Like everything else in the van conversion process, the electrical system is a series of trade-offs. There’s nothing wrong with using lead acid batteries, it’s just a different set of concerns from lithium. If you think you’re going to be able to afford to swap out for a lithium system in a couple of years, you could always look in to used batteries from UPS systems or commercial solar systems. They occasionally come up on Craigslist or eBay. Those batteries have no history. They may last a year, they may last five. But they are a bunch cheaper than buying new. Only you can decide whether that’s a false economy or not. I would not skimp on the inverter. Be sure that you’re buying a pure sine wave model with enough inverting power to run your induction cooktop. You didn’t mention it, but it’s likely you want a combined inverter/charger so that you can take advantage of shore power if it’s available. If your inverter isn’t up to the job, it’s wasted money because you’ll have to buy another one. Another cost-saving option is if you decide to use a portable propane camp stove for cooking. Then you can get away with a smaller capacity inverter and less batteries. Again, trade-offs. Sounds like you’re trying to stay stealthy and low profile on the roof, but that’s going to eat in to your budget. I think the flexible solar panels are more expensive per Watt than the rigid ones, so that might be a place you can save some money. Trading off stealth for panel cost. 600W of solar is a nice sized system. Depending on how much sun you expect to see where you’re planning on traveling, it might be more than you need if you’re running lead-acid batteries. The batteries will soak up all that current when they are depleted, but once they reach around 80% charge, they can’t take the same rate of charge. They’ll dial back how much current they take from the solar panels. Do the calculations so that you can be sure you’re not over-speccing the solar compared to your battery capacity, or plan on using the excess power as a diversion load (to heat water for instance). A larger solar system will require a beefier solar controller, which in turn costs more money. 690Ah (345Ah usable) of lead acid is more than many people install. Only you can decide how much capacity you need. This page might help you work it out. We love the capacity to camp pretty much indefinitely with our setup. If you know you can recharge more frequently, you might not need that capacity. There is however a lower limit for lead-acid if you’re trying to run power-hungry 110v appliances. So, the answer is all “it depends.” I know that’s frustrating, but hopefully I’ve given you some ideas to consider. Hey Dieselfumes, Your site has been a massive help in my planning stages so thank you for that! and utilizing Victron components like yourself. I feel confident with my plan until I run across the words “BMS”. I am having trouble finding info on a BMS system that would work with a proprietary Tesla battery (all my fault of course) or if I would even need a BMS for complete module to begin with. Would love to hear any info or insight you may have about this situation I so squarely positioned myself in. Unfortunately I have no knowledge that will help you with your quest for a BMS that works with a Tesla battery, but I might know a person who does. 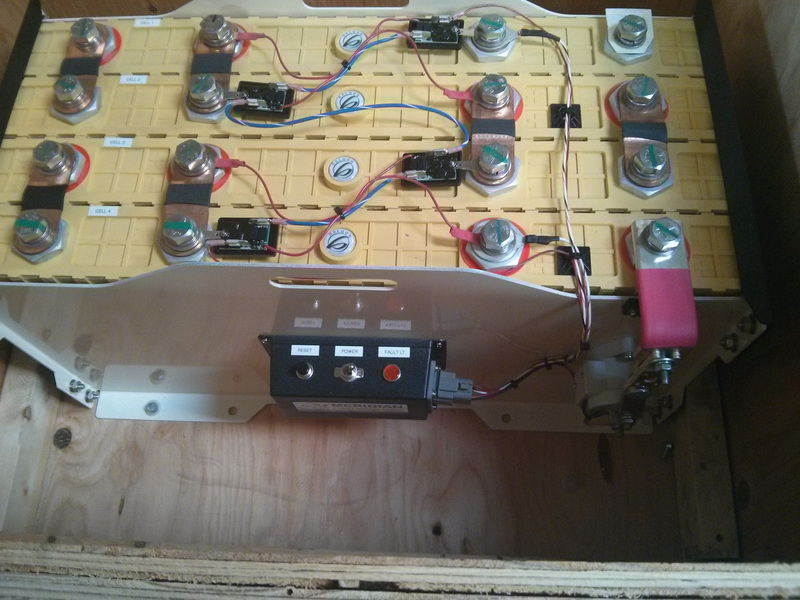 LifeByDesign on the Sprinter forum installed two Model S batteries in their build. I suggest you send them a personal message on the forum and see what they did on that build. I’m assuming that the company you bought the battery from doesn’t offer a BMS solution for those cells. I imagine it would be a pretty specialist thing – even more so than most BMS systems on the market already! Unless Tesla has some marvelous trickery build into their battery modules (which I doubt), then over time the cell voltages could drift which will either lead to some cells getting overcharged or to the whole pack losing capacity. That’s why the BMS is important. I went the CALB battery route with a standard BMS which cost ~$2300 for ~4.2kWh; wish this would’ve been an option back then! The description states: “They also have an integrated connector with cell level connectivity for BMS systems” and 3.8V cells, which suggests that a standard BMS should work. I got mine from these guys (http://www.electriccarpartscompany.com/) and I’d recommend giving them a call. I told them my battery setup & they put together the right order for me. Von: Which BMS did you go with for the CALB batteries? Thanks! Hi Mike, I used the standard House BMS from that company – has worked just fine for me, but I don’t see it as an option anymore. I think most BMS for lithium batteries will work fine. Interesting article. My Sprinter has an 80 litre solid fuel water heater which provides constant heat overnight from a couple of logs or smokeless coal. Connected to the flu is a gas cooler and electric generator. Heat from the generator exhaust is transferred to the water tank mentioned above via the gas cooler (a second hand part from a Volvo car – and sourced from e-bay). The generator charges the lead acid batteries when 400 Watt solar panels are not sufficient in the winter time. I installed under floor heating (granite tiles!) to both take heat from the flu but also as a heat sink for a future solid state power source (such as the Devilwatt) – this is a “Seebek” device which requires a very hot side (e.g. side of flu) and very cold side (water cooled) – some can generate up to 100w. Further value of a solid fuel burner is that you can dispose of all bio waste in the vehicle (e.g. from meals – fat, bones, peel etc.) However, I’m looking to take that further and build a custom toilet that can convert poop into fuel. There are also several water circuits – one circuit pumps water via two heat exchangers – one powers the taps (and future shower), the other takes heat direct to two water filled radiators at the front of the van. The pumps automatically power up when the water hits a temperature above 45 degrees centigrade. Kevin, if you’re prepared to have flames inside the van, then it does open up a lot of possibilities for heating and power generation. Keep those carbon monoxide detector batteries fresh!